In a good year, we make perhaps 20 movies here in Norway. Only a few years ago, 10 movies annually was the norm. Most films are made with government support which means that all projects are subject to approval, and up until recently genre films almost never got enough backing to get off the ground. Norway has produced only two regular science fiction feature films, and our horror offerings can be counted on one hand. Dark Woods (original title; Villmark) is therefore an exception to the rule, and fortunately it keeps the current good reputation of Norwegian films up. A group of people who are planning to produce a reality TV show travels to a remote cabin in the forest to build team spirit for a weekend. Two girls, two young males and the leader of the gang, Gunnar (Bjørn Floberg). The two guys soon find an abandoned tent in a nearby lake, and a dead women in the lake. They are ordered to stay away from the lake, but now weird and scary things start to happen in the forest. With practically no tradition for horror movies, it is always interesting to see what the Norwegian movie “industry” can come up with in that department. With so few movies produced, each one has to be unique and creative, and Dark Woods certainly delivers, by Norwegian standards at least. Compared to international movies, Dark Woods is an amalgamation of well known movies and cliché stories. Literally, it is a mix of Evil Dead, Blair Witch Project and an old Norwegian spookie, The Lake of the Dead. It makes great use of the “something is out there” plot which almost all “remote cabin” movies use. Like many movies in the genre, it also uses the notion that the forest is a spooky and dangerous place in itself and that the redneck hillbillies that live there are prone to killing people, or at least be involved in really bad business. Add to this some technology-and entertainment-dependance for social commentary. Finally, if you’re a loud-mouthed city youngster, you’re likely to be killed when you leave the urban street lights. All these movie clichés come together in Dark Woods quite nicely, where the atmosphere – created with music, light, camera work, and characters – captures you from the first moment and makes you believe what happens. I am a little annoyed by the use of reduced colour intensity, which – along with colouring – is a fancy trick of the trade these days, to make movies seem more grim or to make them look like a certain location. For example, movies from WW2 will try to look gray-ish so that they resemble black-and-white film reels from that era, or to make them look dirtier. With Dark Woods, the reduced colours suit most of the movie, because it mostly takes place at night or inside the cabin, but it is a constant nagging factor, though not a big one. Bjørn Floberg plays the group leader who is most likely to snap and go crazy, and his character is used to great effect to trick us into thinking in wrong directions. The other four characters are nicely spread out on this rare horror-slice of bread; the Swedish tough girl, the arrogant young male, the sensitive and sensible guy, the fragile female you want to protect. All actors do their job nicly, but with Floberg exceeding everyone else as the almost psychopathic “old wise man”. 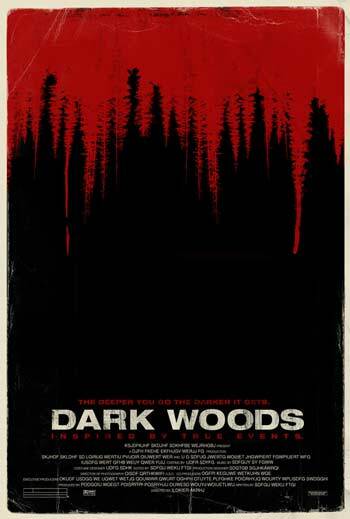 Dark Woods is pure fun, with great atmosphere, good actors and by Norwegian standards a unique movie.